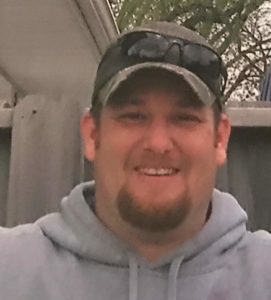 Clint D. Schriber, 39, of Emden, passed away January 16, 2019 at his home. Visitation will be from 5-7 PM Monday, January 21, 2019 at Holland Barry & Bennett Funeral Home with a Rosary Service at 4:30 PM. Funeral Services will be held Tuesday, January 22, 2019 at 10 AM also at the funeral home. 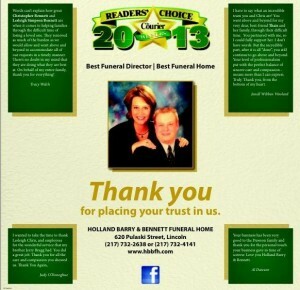 Burial will follow in Holy Cross Cemetery. Clint was born August 5, 1979, the son of Harold Schriber and the late Rita (Mileham) Duvall. He married April Briggs. Clint was an avid outdoorsman. He shared his love and knowledge of the outdoors with his sons. Together they spent time making memories hunting, fishing, and riding ATVs. Clint worked as a truck driver for Encompass Grain. He previously drove for Bottrell Farms and had worked at American Freightways. His love for life and his quick witted sense of humor will be greatly missed. Surviving are his father Harold Schriber; wife April; sons Collin and Tanner ; sisters Jennifer (Rad) Bishop and Sadie Schriber Broyles (Mark Yoggerst); grandparents Ronald (Nancy) Schriber; and a nephew, several nieces, cousins, and friends. He was preceded in death by his maternal grandparents and his mother, Rita Duvall. In lieu of flowers, memorial donations may be made to the Schriber Boys Education Fund at Farmer’s State Bank, Emden.